Hey, I finished a hat. I dug deep into my stash and uncovered a skein of some Latvian yarn I bought off ebay in late 2008. I knitted a cardigan from it in early 2009 and so had a couple of left-over skeins kicking about. Since 2008/2009 I have clearly become accustomed to far better quality yarn as I did not enjoy knitting with it at all. Twine should cover this experience fairly comfortably. Still, it is hard-wearing yarn (my cardigan has held up very well) and I love the colour. The pattern? I looked through all my books and magazines, and came up with a pattern from Lene Holme-Samsøe's beautiful Mere Feminin Strik (now available in English translation through Interweave Press). I haven't knitted from a Danish pattern in ages, so I thought it would be a nice little challenge. It wasn't a challenge at all, actually. 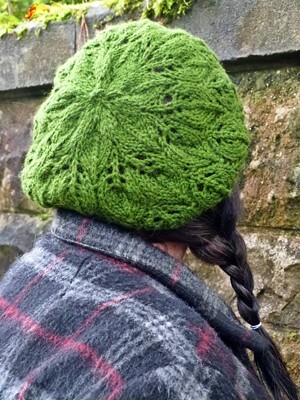 The hat is knitting from the crown downwards with the Shetland Fir Cone pattern organically flowing outwards. You knit the last repeat straight which then organically flows into the ribbing. Yes, I used the word "organically" twice, but that was deliberate. The design has been thought-through with each element guiding you towards the next. It was a really good knitting experience even if the yarn could have been better - and interesting from a design point of view. What is currently on my needles, then? I am still working away on Bute. One front & the back are done. It's my treat-knitting. The thing I get to knit on when I have dealt with soul-destroying paperwork or dealt with a beastly chart problem. I hope to have it finished by the end of December, but we shall see. 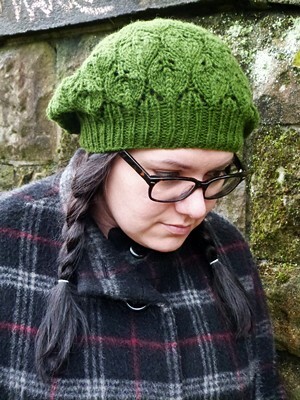 My knitting group project is Brooklyn Tweed's Quincy hat. I am knitting it in Rowan Cocoon in "Shale". It is simple, meditative garterstitch with an applied i-cord edge. The sort that would drive me up the wall if I had to knit it without distractions, in other words. Perfect for knit night. A new hat design is also in progress. So far I have just swatched several versions of the same idea and worked out a bit of maths. It's part of my Doggerland collection which I am slowly pulling together. Exciting stuff (for me at least). 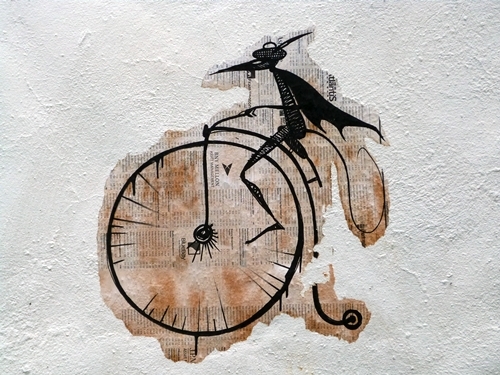 I'll leave you with a piece of street art I saw the other day..
PS Whitman? Why's the hat called Whitman? A very simple, almost trite, explanation..